Carvan was born in Abilene, Texas in 1957 and obtained his B.B.A. degree from Baylor University and his M.B.A. and J.D. degrees from Texas Tech University. 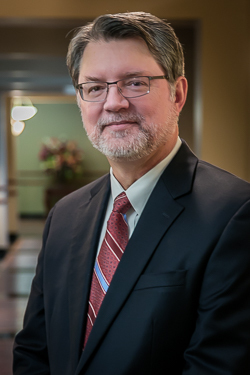 His practice consists primarily in two general areas of representation, counsel to public entities and employment law addressing employment issues and disputes from job interview to post-termination litigation. Carvan serves as General Counsel to several Mental Health Mental Retardation Community Centers as well as the State entity Texas Counsel of Mental Health/Mental Retardation Community Centers and local Workforce Development Boards. The position of general counsel to public entities necessarily involves addressing a variety of legal issues on behalf of the public entities and their employees. In the area of employment law, he has represented clients before the Equal Employment Opportunity Commission, the Texas Commission on Human Rights, the United States Merit Systems Protection Board, and the State and Federal courts of Texas. • Gun Law Signage presented to Texas Council Risk Management Fund, January 2016. • Gun Law presented to Texas Council Risk Management Fund, Liability Workshop, October 2015. • Texas Council of Community Centers Board Training - Trustee Roles and Responsibilities, Texas Council Annual Conferences 2007-2015. • LifePath - Supervisory Training, LifePath Systems, July 2015. • Legal Imperatives for the Community Center Systems, Risk Management Foundation for Executive Leadership, July 2015. • Registration of MHMR Centers with DPS/DEA, April 2015. • Dallas Metrocare - Board Training, June 2014. • LifePath Systems - Texas Open Meetings Act, April 2014. • Affordable Care Act - Are you Ready? Texas Council Risk Management Fund, April 2014. • Laredo MHMR Center Board Training - Roles and Responsibilities, November 2013. • North Central Texas Workforce Board of Directors Retreat, August 2013. • Rules, Responsibilities of Texas Non-profit Members, Directors, Officers and Employees, City of Granbury, Texas, June 2013. • Gun Law, Texas Council Risk Management Fund Employment Law Seminar, May 2013. • Betty Hardwick - Board Training, February 2013. • Texas Council Risk Management Fund - Integrated Care, January 2013. • TCU Employment Law Issues, July 2013. • Plus many others on various topics of interest to our governmental clients. ©2011 by Taylor, Olson, Adkins, Sralla & Elam L.L.P. All Rights Reserved.